(TibetanReview.net, Feb02’19) – President Lobsang Sangay of the Central Tibetan Administration at Dharamsala, India, has on Jan 31 met with MPs belonging to the Tibet group in the country’s parliament. 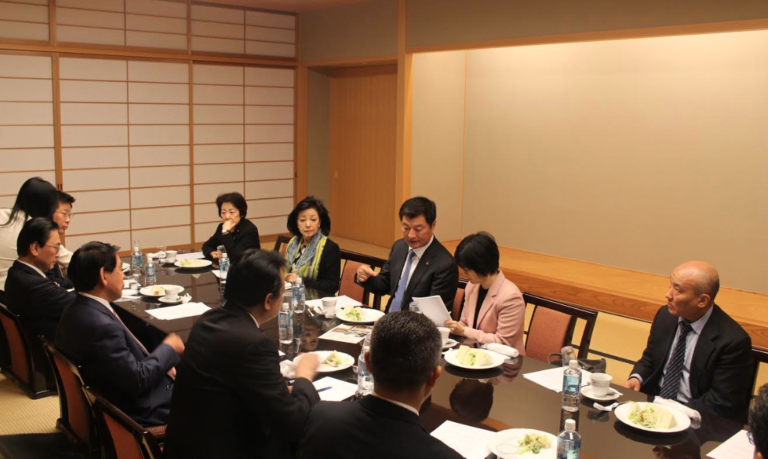 The All Party Japanese Parliamentary Tibet Support Group is the largest such Tibet support group in the world. During the hour-long meeting, President Sangay was stated to have briefed the MPs on the current situation in Tibet and developments concerning the Tibet issue, including the Reciprocal Access to Tibet Act and Indo-Pacific Reassurance Act signed into law recently the US President Donald Trump. At the meeting’s conclusion, the All Party Japanese Parliamentary Tibet Support Group issued a statement expressing support for the exile administration’s Middle Way Policy of seeking genuine autonomy for the Tibetan people within the framework of the Chinese constitution, said the CTA on its Tibet.net website Feb 1. The MPs were stated to have strongly criticized China’s suppression of the unique culture, education, language and religious freedom in Tibet. Those who attended the meeting, which took place in the parliament, or Diet, building, were stated to include the group’s Chairman Mr Shimomura Hakubun, a former education minister belonging to the Liberal Democratic Party; Mr Watanabe Shu, Vice Chairman of the Party of Hope; other Liberal Democratic Party members Ms Yamatani Eriko; Mr Furuya Keiji, Mr Seichi Eto, and Mr. Nagao Takashi; and Mr Baba Nobuyuki from the Japan Innovation Party. Also present was stated to be Ms Sakurai Yoshiko, a veteran journalist and head of think tank Japan Institute of National Fundamentals.